Robin Laughlin (aka. 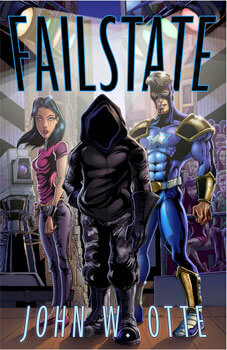 Failstate) is in a reality show to become an official, licensed superhero. But when one of his competitors is murdered, can Robin find justice? Or will his lunk of a big brother ruin everything? 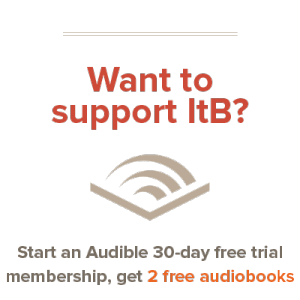 My thoughts: I can understand if someone is a bit wary of reading this book, at first. The cover art, though talented and meaningful, is a bit cheesy in concept and, let’s face it, cartoon-ish. But once it’s cracked open, it is not nearly as bad. With a wonderful writing style similar to Travis Thrasher’s, Mr. Otte captures the reader’s attention and holds it in place. The plot was mostly well-planned, and didn’t appear too cliche at the end. In fact, it was a bit harder to predict than many sci-fi/mystery titles. However, near the middle, Otte begins to lose the reader’s intrigue, by confusing them with so many details, and they don’t know what to do with them all! Each person could be the true criminal, and the reader is left throwing his hands in the air, because they are all suspect. He must simply read on, not caring as much as before. To end on a positive note, Otte did a great job incorporating Scripture into key parts of the book. When Rob would attend a youth group lesson, or talk with fellow Christians, there was always something he needed, which is likewise important to us. This book was provided free by the publisher, in conjunction with Team Novel Teen. I was not required to write a positive review, and the opinions expressed are my own.